Origin and Habitat: Endemic to a from a small barren, inhospitable corner of North Paraguay almost up to the border to Bolivia. Called Cerro Leon (approximately 120 square kilometres). Altitude: It grows at elevations between 100 and 600 metres above sea level. Habitat: Dry thorny forest up to 6 metre high with and almost impenetrable bushes where many groves shed their leaves during Winter (June-September). 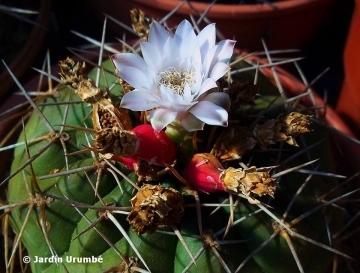 It grows along with opuntias and different bromelias. The soil consists of clayey silt that is covered by loess and loess clay. It is rich in nutrients with pH-value is between 6,8 and 7,2.During dry periods the ground becomes "rock-hard". The yearly rainfall ranges between 500 and 800 mm. During winter, temperatures sink as low as 0°C, while rising up to 50°C during summer. 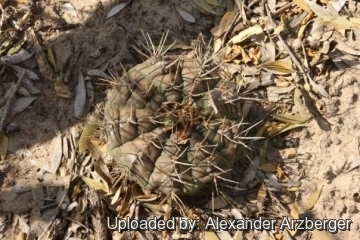 This cactus occurs in a very remote area that is rarely visited and there are no known threats, it seems to be common, and it is present in a protected area. 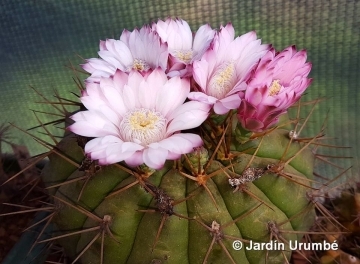 Gymnocalycium eurypleurum f. aurata cristata hort. 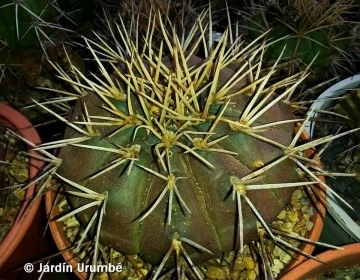 Gymnocalycium eurypleurum f. rubra hort. 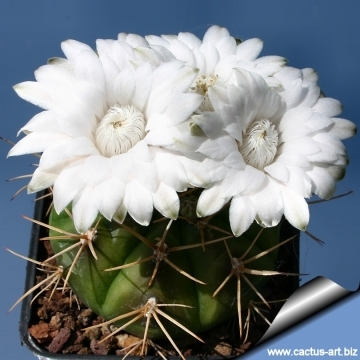 Description: Gymnocalycium eurypleurum is a variable low growing species, especially for spination. (Some plants have minimal spination while others seem quite heavily armed). Habit: This species always grows solitary. Stem: Glossy green, dull olive-green to brownish, flattish globular (mature plants may become slightly short columnar) 7-15(-20) cm across, with a somewhat sunken apex. Ribs: Usually 7-12 (up to 16), very flat and broad, with scarcely evident protuberances and often a small horizontal indention above the areoles. Areoles: Covered by some tomentum. 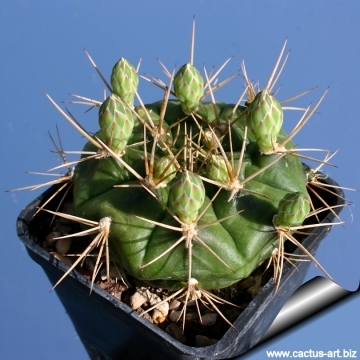 Spines: Stout, awl shaped, glassy white to light-brown in clusters of about 7 mostly straight up to 10-30(-60) mm in length, very symetrical, and tending to curve upwards, away from the body of the cactus. Usually there are no central spine. The 1 or 2 central spines (when existing) have the same length. Flowers: Mostly near the apex, bell-shaped, pure white or white with a hint of lilac, about 30 mm in length and diameter. Inner petals are white to light pink, outer petals are a light purple colour with a dark purple centre strip. Filaments and style are white. Anthers creamy-white to pale yellow. Blooming season: It flowers freely throughout the Summer. Fruits: Round or barrel shaped, about 20 mm in diameter, red with scales of the same colour, fruits are juicy and of a carmine colour. Seeds: Almost nodular, yellowish brown with very fine protuberances, about 0,7 mm in length, Hilum, white long and thin. 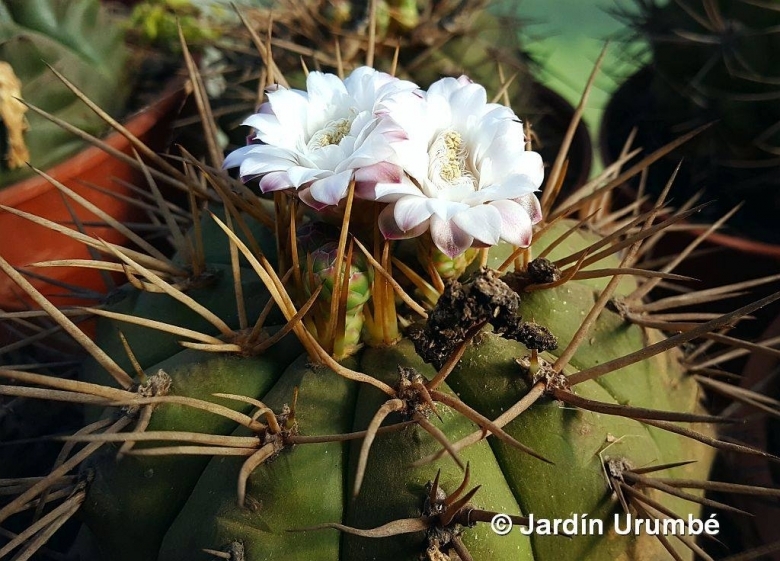 Gymnocalycium eurypleurum f. aurata cristata hort. : has crestred fan shaped stems of a bright yellow-orange colout due to the absence (or reduced production) of chlorophyll pigments. 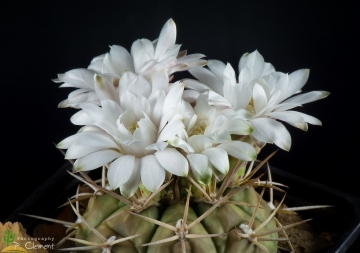 Gymnocalycium eurypleurum f. rubra hort. : is a mutant completely lacking chlorophyll pigment. The result is a red plant. Notes: This independent taxon seems to be related to the G. anisitsii/damsii complex. 4) Demaio, P., Kiesling, R., Pin, A. & Oakley, L. 2013. 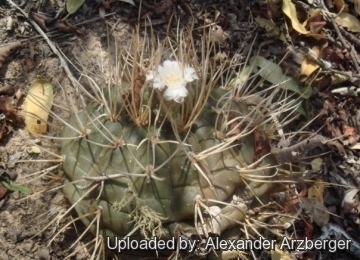 Gymnocalycium eurypleurum. In: IUCN 2013. "IUCN Red List of Threatened Species." Version 2013.2. <www.iucnredlist.org>. Downloaded on 18 February 2014. Cultivation and Propagation: It is a summer grower species that offers no cultivation difficulties. Water regularly in summer (but do not overwater ) Keep this plant almost dry in winter at a minimum temperature of 0°C, prefer relatively rich substrate and low pH compost (if possible not limestone) otherwise growth will stop altogether. Feed with a high potassium fertilizer in summer. It is quite frost resistant if kept dry (hardy to -5° C) This plant needs plenty of space for its roots, repotting should be done every other year or when the it has outgrown its pot. This species is particularly easy and accommodating, seldom suffer of cryptogamic diseases. Sun Exposure: Light shade. It may tolerate bright situations but is likely to suffer from sun scorch or stunted growth if over exposed to direct sunlight during the hottest part of the day in summer.